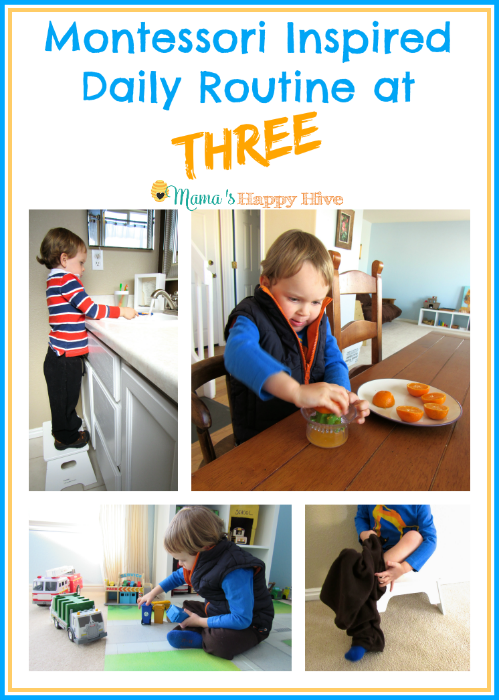 Montessori Inspired Routine at Three - Mama's Happy Hive Our daily Montessori inspired routine at three is full of practical life skills, playtime, and adventure. I'll start this Montessori Inspired Routine at Three post by saying that I am not the most structured person. That may seem unlikely after posting an entire year of a planned homeschool curriculum. LOL! However, I think what plays into our home life is the nature of my husband's and my own career. I am a nurse and my schedule is always changing. I work sporadically throughout each month, filling in the holes for the work schedule. My husband doesn't have to report to his job at a specific time each day, as long as he gets his 80 hours in every two weeks. So this adds a lot of flexibility to our daily routine. However, most days do follow a similar pattern and I will share that with you in this post. *Please note that Little Bee just turned three years old, so this daily routine really reflects the last 6 months (2.5 -3 years old) and may change as he matures. Enjoy our day full of practical life skills, independent care of self, playtime, and adventure! 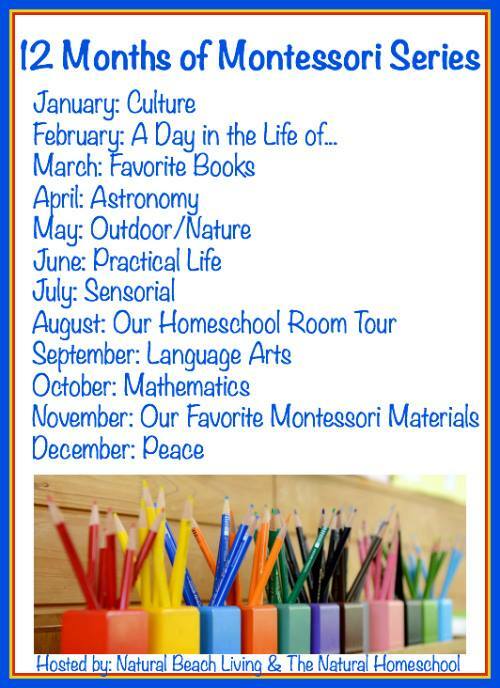 Plus, a little Montessori homeschool time, 2-3 days a week. The same goes for toilet learning. Little Bee knows exactly how it's done and can do it. 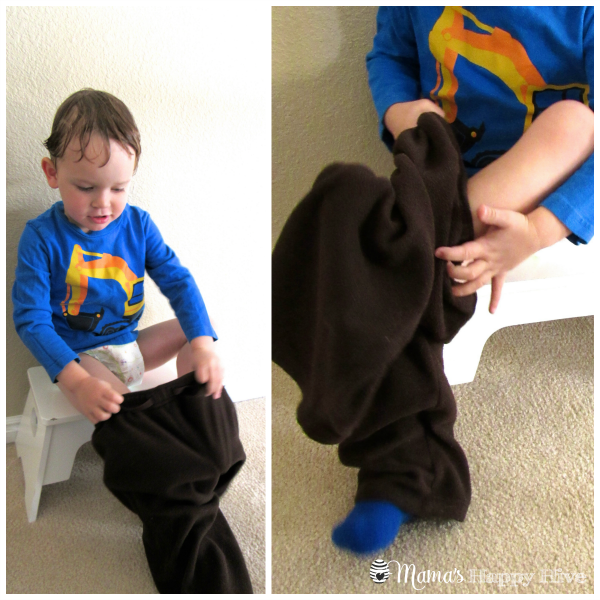 He has complete control over his body, but he chooses to go in his diaper. So this Mama is waiting for him to be ready and willing. Plus, being a first time parent, I'm still learning how this all works too! 8:00 am - We sit down and eat breakfast together as a family. Little Bee likes to help with breakfast by preparing the scrambled eggs, peeling hard boiled eggs, slicing bananas and apples, and making fresh squeezed orange juice. 9:00 am - After breakfast is worship time which includes singing songs, reading stories, and prayer. Then we say good-bye to Daddy as he heads off to work. 9:30-12:30 - This part of our day is the most productive time of day to accomplish our most important tasks. However, this part of our day varies each day of the week. Some days I work around the house or on my computer while Little Bee plays independently (or not so independently - depending on the day.) 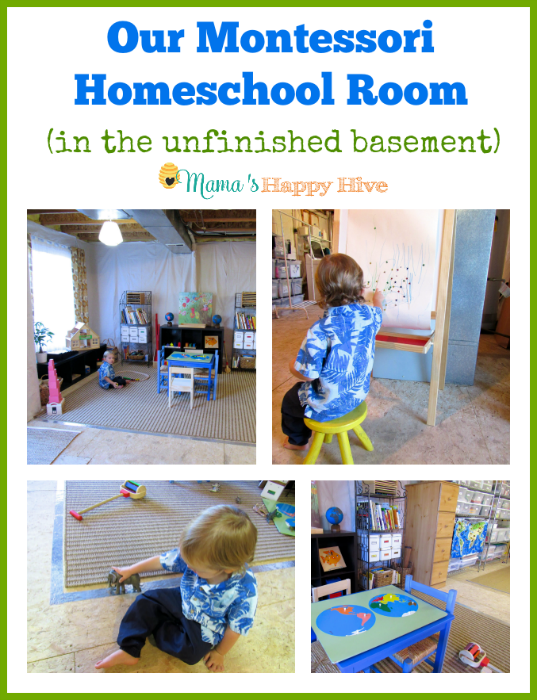 At least 2-3 days a week, during this allotted time, we do constructive Montessori homeschool activities in our basement classroom. Other mornings we have doctor appointments, shopping, or play-dates scheduled. 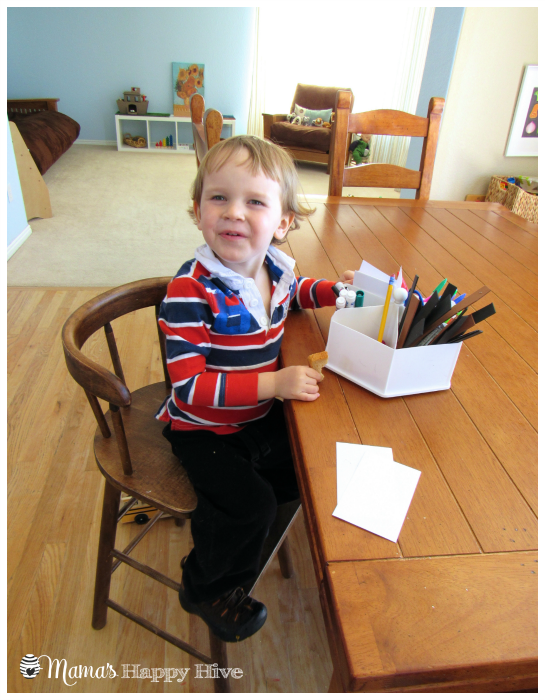 I want to share more about our Montessori homeschool activities that we do 2-3 days a week. I love to put together unit studies for Little Bee to explore. These unit studies usually include language work, counting, fine-motor, gross-motor, arts/crafts, practical life skills, and more. I plan one unit study for every week and the unit study follows the interests of my child and/or the seasons of the year. Please visit, Montessori Inspired Turtle Unit for an example of a unit study that we did recently. One thing is for sure, Little Bee always finds time to play with his trucks. Little Bee's favorite thing to play with is his community of transportation vehicles and he will play with these toys for hours upon hours... every single day! 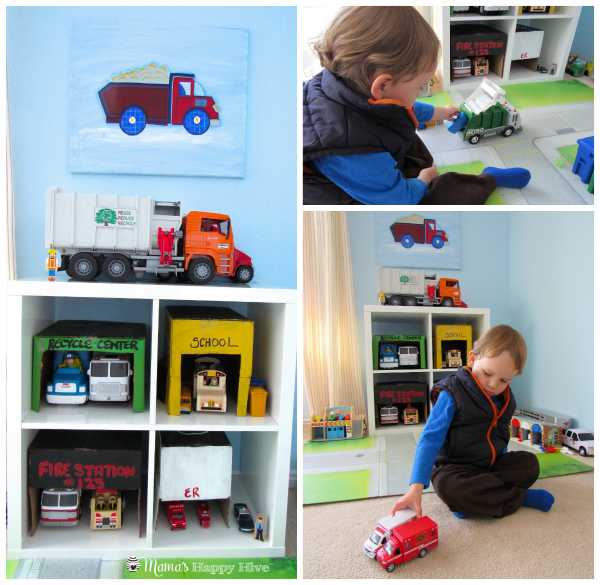 On warm days, Little Bee will take his trucks outside and play. 12:30 -1:30 - Lunch Time & Clean Up Time. 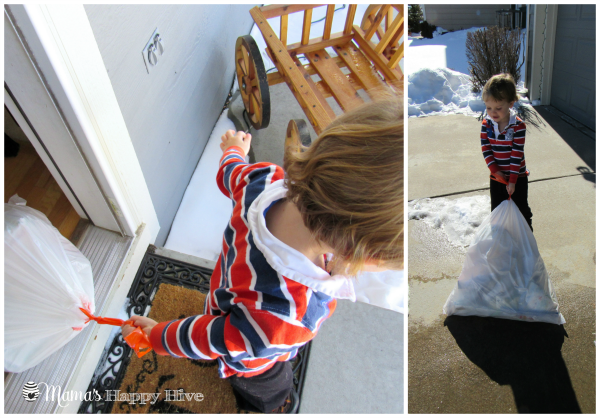 Little Bee's favorite chore is taking out the trash. Everyday he goes throughout the house with a big trash bag and collects the trash. Then he drags it out to the big trash can by the side of the house. He never seems to tire of this chore! He loves to be a helper! 1:30-2:30 - We take a walk every single day, rain or shine, freezing cold or blazing hot! We don't let the weather stop us from getting outside. I think this mind-set comes from my Finnish heritage. If it's freezing cold, we layer our clothes. If it's blazing hot, we sweat! I learned how to sweat from all those saunas growing up. My husband still can't understand why I take blazing hot showers everyday. LOL! Little Bee helps with walking our dog Sadie, as she drags him around the block. Each day we take a different route around our neighborhood and usually Little Bee directs us towards the fire station to hopefully catch a glimpse of the fire truck in action. On our walks, Little Bee enjoys collecting bits of nature to bring home for closer examination and exploration. 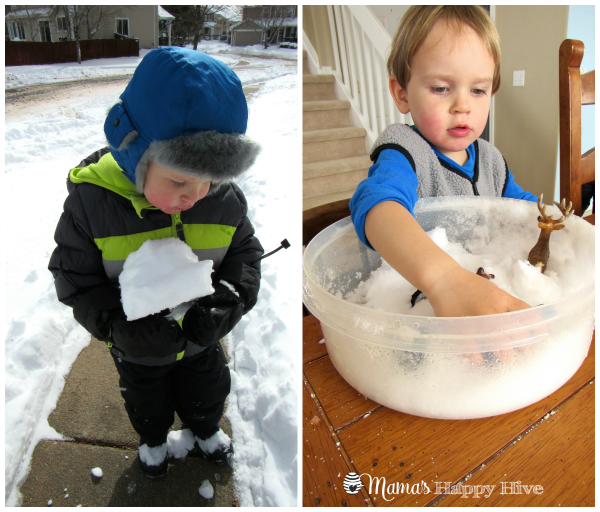 The other day, we had a huge snowstorm and Little Bee wanted to bring home a clump of snow to play with. I set up a sensory tub with the snow and his forest animals. He played until his hands were too cold to play anymore. 2:30-5:00 pm - This is either nap time or quiet time depending if Little Bee is willing to take a nap. Since becoming pregnant, I also take a nap during this time. LOL! Otherwise, I am on my computer furiously trying to get blogging work accomplished. Little Bee still sleeps on his floor bed for nap time and bedtime. 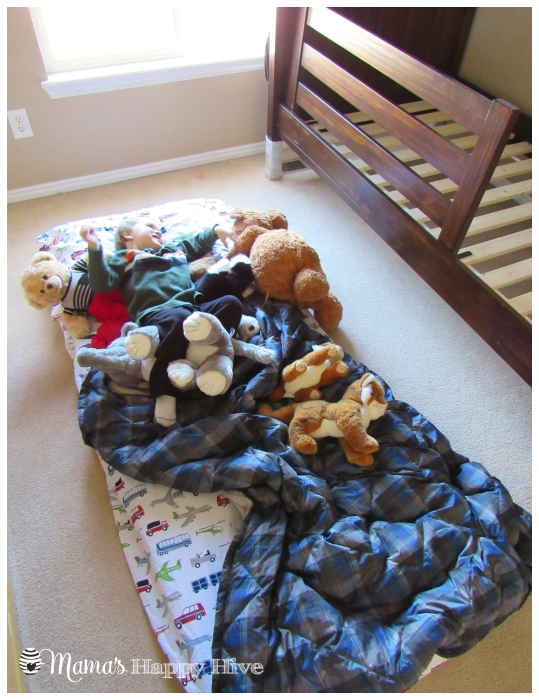 He has slept on his floor bed since he was about 6 months old. Since we moved into our new home, we bought him a "big kid" bed. We are just waiting for the mattress to arrive and then Little Bee will transition to his big bed. 5:30 - Dinner. Little Bee still sits in this "antique" chair I found at a furniture consignment shop. He has used this chair since he was about 1.5 years old. He is able to climb up into it and out of it all by himself. He claims it as his "own" chair and no one else is allowed to sit in it. LOL! This chair has worked beautifully for our home and was more affordable than a Stokke Tripp Trapp chair. 7:30-8:30 pm - Bedtime Routine: Brush Teeth, Bath, Pajamas, & Read Stories. 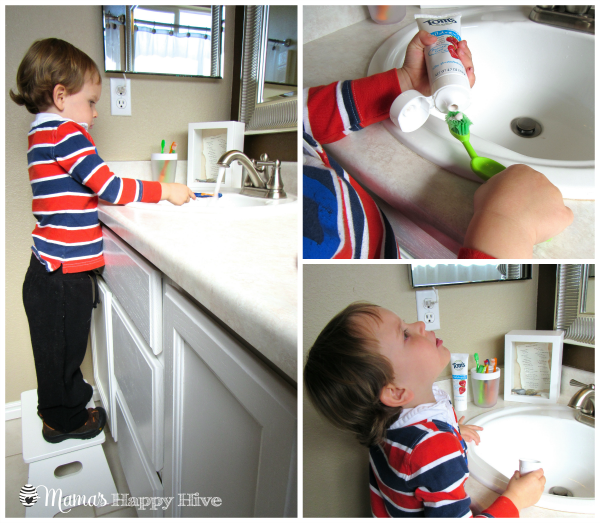 Little Bee does a great job (most of the time) at brushing his own teeth and even gargling with mouthwash. He still needs help with flossing. 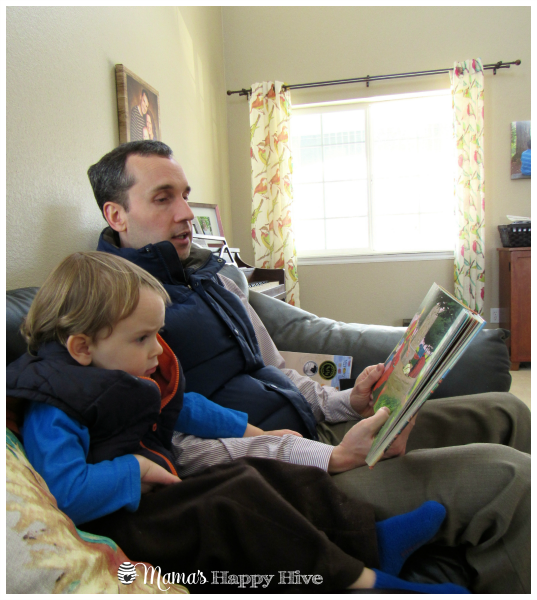 Little Bee loves to spend the last moments of his day with his Daddy while he reads him stories. 9:00-10:00 pm - Goodnight! We always try to get Little Bee to bed between 8:30-9:00 pm, but he is in a phase right now where he doesn't want to go to sleep till both Daddy and I go to bed. I think the fact that most days he does take a long nap (2-2.5 hours) till almost 5 pm plays a part in this bedtime fuss. However, I love those quiet nap time hours and I'm not ready to cut them short yet... even if that means a late bedtime for everyone. 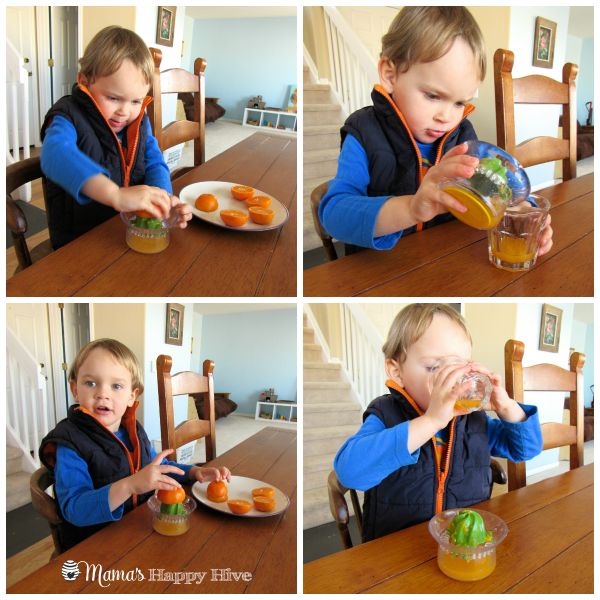 Follow Mama's Happy Hive's board Montessori Practical Life Skills on Pinterest. I love seeing Little B in action. How grateful I would be for somebody who would take out the trash! What a fun day! I love your philosophy about going outside. It’s something I strive for, however my kiddos become so dis-regulated when we do go outside, it makes things difficult. We have HUGE plans in motion to help with that. (I can’t wait to share!) Before children I worked for a husband and wife as a nanny. They were both doctors and followed the same philosophy. I can’t wait to see what your routines and schedules look like once the new baby arrives! Wow! B is getting so big! It is fantastic to see the day in your home. Such a great mix of fun and learning. Love it! Little Bee looks so big! I love that you take a walk every day. Thank you for sharing such a beautiful day. 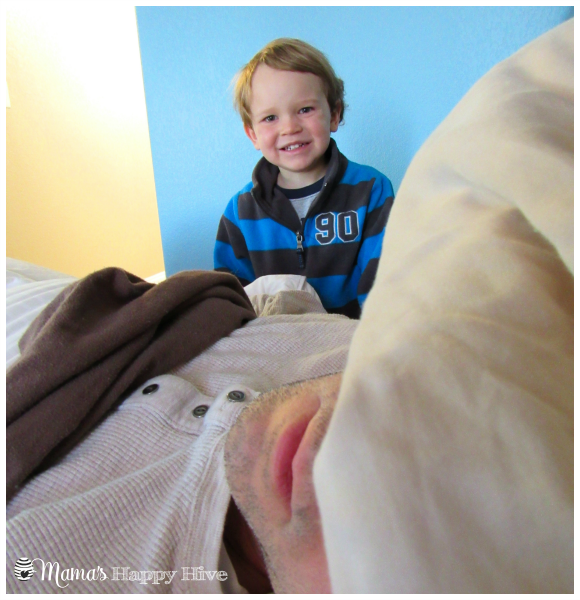 And this “Daddy and I are not morning people” LOL!